Matt Czuchry — Millie Lewis of Charleston Model & Talent Agency Millie Lewis Model Agency iin Summerville, SCi s a full service model and talent agency representing male and females of all ages and abilities. We offer representation for trained and experienced models seeking work in the Southeast. Advanced and professional modeling programs are available for those completing our personal development programs. We received the Lifetime Achievement award for integrity and placement, one of our industries highest honors. 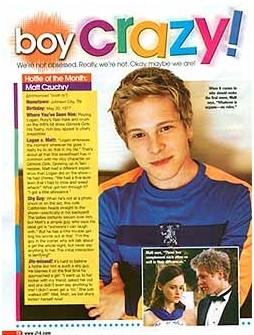 Matt Czuchry was born in and grew up in Johnson City, Tennessee. His father, Andrew, is a professor at East Tennessee State University, and his mother, Sandra, is a housewife. Matt graduated with honors in 1999 from the College of Charleston, with a Bachelor of Arts degree in History and Political Science. He won the Mr. College of Charleston pageant in 1998. Czuchry attended college on a tennis scholarship, captained the men’s tennis team, and was an NCAA ranked player in the Southern Conference. He took one theater class in college, and his professor encouraged him to change his major to drama. He came to AMTC and won the Agent’s attention in both acting and modeling. The Vice President of Feature Film Casting for 29th Century Fox, Christian Kaplan, liked Matt, and told him that if he came to Los Angeles, he would help him! Matt’s first big role was as a series regular on WB’s “Young Americans.” It was his first role in The WB’s Young Americans that he met Kate Bosworth, whom he dated from 2000-2002. He became better known for the role of Logan Huntzberger on the television show The Gilmore Girls on the CW. Prior to this role, Czuchry had a recurring guest role on the CBS drama Hack and starred in the pilot of UPN’s Jake 2.0. He also guested on Freaks and Geeks, 7th Heaven, The Practice, Veronica Mars, and Friday Night Lights. Since 2000, Czuchry has played the role of young, ambitious Harvard-educated lawyer Cary Agos on the critically acclaimed CBS drama The Good Wife. He appeared in the movie Eight Legged Freaks and Slap Her….She’s French. Czuchry played the lead role in the film adaptation of Tucker Max’s I Hope They Serve Beer in Hell. From September 11 to October 28, 2007, Czuchry performed in Wendy Wasserstein’s play Third opposite Christine Lahti at the Geffen Playhouse.